Puragra (Raja) GuhaThakurta, a professor of astronomy and astrophysics at UC Santa Cruz, started the Science Internship Program for high school students after mentoring three students in 2009, giving them computation-based research projects to work on during the summer. The program has grown rapidly at UC Santa Cruz and now involves faculty across campus in a wide range of STEM (science, technology, engineering, and math) fields, who have worked with students from 46 different high schools. Now, GuhaThakurta wants to expand the program beyond UC Santa Cruz and engage a more diverse group of high school students. He will be spending the next eight months on sabbatical at Google in Mountain View, CA, working with University Relations and Engineering Education teams to expand and diversify the Science Internship Program (SIP) to serve high school students throughout the country. "The hallmark of SIP is it embeds high-school students in real computation-based STEM research projects. Strong mentoring by university researchers--graduate students, postdocs, research staff, and faculty--has been a key reason for the program's success," GuhaThakurta said. To date, about 60 percent of the participants in the program have been female students, he said. Of the nearly 100 SIP alumni who have decided on college majors, more than half have opted for computer science. By working with the University Relations team at Google, which has ties to many research universities, GuhaThakurta hopes to replicate the UC Santa Cruz framework at other sites. At the same time, he is looking to diversify the program through a greater emphasis on students from groups that are underrepresented in the STEM fields. 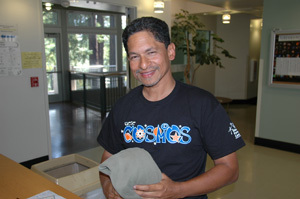 GuhaThakurta has already begun building connections between SIP and other programs for high-school students, such as the UC-wide COSMOS program (California State Summer School for Mathematics and Science). His host at Google will be Ira Pramanick, a software engineer who started a non-profit organization called More Active Girls In Computing (MAGIC), which provides mentoring to middle and high school girls. Other collaborators include Cameron Fadjo, project faculty lead for EngageCSEdu, one of several programs developed at Google that focus on diversity and STEM education. GuhaThakurta noted that MAGIC and COSMOS have been effective in attracting underrepresented high-school students. By expanding SIP, he wants to increase the opportunities for such students to get hands-on experience doing independent research projects. Programs such as MAGIC and COSMOS could serve as crucial stepping stones, preparing students to take on the challenges of an independent project. "Most SIP interns to date have been generally well prepared to take on the many new challenges associated with leading an open-ended, independent STEM project. To use an analogy, they are good swimmers so it is fine to throw them into the deep end of the pool," GuhaThakurta said. "As we expand the program, we have to ensure that all students have the preparation and support they need to be successful." In the summer of 2015, GuhaThakurta plans to increase the number of SIP program centers to four, leading to a 50 percent increase in the number of students reached during this pilot expansion. The UC Santa Cruz program has been operating at full capacity for the past two years, GuhaThakurta noted, and this new expansion plan will put SIP on track to reach over 1,000 new high school students at universities throughout the country by 2020. "It is a matter of getting other researchers to see the value of including motivated local high-school students in their research, and then providing a framework for student participation and examples of projects that have worked well in the past," GuhaThakurta said.